In the past few months I (Marty) made application to work directly with the Genocide Inervention Network - and am wonderfully delighted that my specific application has resulted in me being named as one of 20 Carl Wilkens Fellows for 2010! I have *no* doubt that I will be a stronger leader intervening and educating about issues of Genocided as a result of work with GI-Net! And I anticipate continued colloboration with GI-Net in our extended efforts towards eupan in the Oklahoma City area - and to any and all interested partnerships! I view this opportunity as something that is unique to me, but *for* all of us already involved in the efforts of the Eupan Global Initiative! The United Nations Climate Change Conference is being held right now in Copenhagen. Leaders from across the world are meeting to discuss climate change. 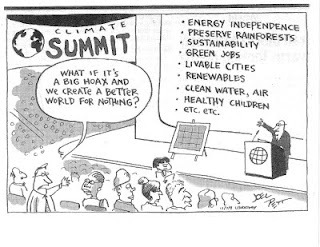 Undoubtedly, there are at least some people from all the Earth's nations have some sort of hope or dream attached to this conference, whether that would be for the conference to debunk the myth of climate change or to provide a foundation to building a more sustainable world. What do you think? How do you respond to this "call" from Tutu? Desmund Tutu invites the world to think about making peace with the planet. How do you respond to the idea of global citizenship? Comment below and tell us what you think. The following image appeared in the USA Today, December 7th, 2009 - by Joel Pett. What if a more friendly, favorable, kind, gracious, compassionate, beneficient, stable, structured, harmonious world *is* available? Isn't it worth trying? Thanks *especially* to Stephen Vandervort for many things he does in helping lead and direct those of us involved in eupan! Stephen is pictured here, beside me, at our Public Screening of Pray The Devil Back to Hall. Oklahoma city's exclusive viewing of Pray The Devil Back To Hell. 1900 hours - doors open. 1930 hours - film begins. 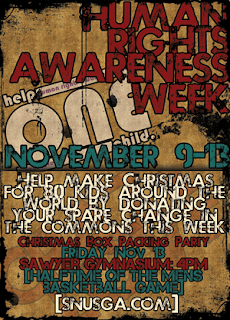 Join the efforts of campus leaders at SNU. Our screening of Pray The Devil Back to Hell is coming soon. If we can provide you with electronic files that you might print/share/email to your friends, colleagues, peers - we would be happy to do so! Please contact us at eupanglobal (at) gmail (dot) com or mmichelson (at) snu (dot) edu and we will get you what you need. Also, we have access to print a limited number of flyers or postcards for those who have need! While my scheduled travel to NYC included intentional plans from weeks ago to meet at the U.N. with staff from the Special Adviser on the Prevention of Genocide, I was surprised by another unique opportunity while in New York City. I had the opportunity to get special access to the offices of the organization, Human Rights Watch. While I had known about this organization and the impact of their work from far away - of course I was able to learn more about what happens in their offices - including opportunity to speak with personnel about their role in the New York City office. They were established in 1978 and have been advocating in positive ways for some 31 years! The picture posted here gained me access to the Empire State Building - without having to pay to get the "tourist" view again this time! That was nice an added bonus (the free view!) to the already nice opportunity to meet with personnel working with Human Rights Watch! A couple of pictures from a wonderful lunch in the Delegates Dining Room at the U.N.! Also, a snapshot at the end of my time with Steve who had coordinated my visit through the Office of the Special Adviser on the Prevention of Genocide. I'm typing out a quick blog entry from a campus computer at Columbia University in New York City! I'm here tonight for a lecture. Had opportunity to meet with representatives at the U.N. today dealing with Genocide. Also had a wonderful private tour of the facility (in and among plenty of other public tours, of course!) Nice lunch. Great day to be in NYC! Do you see anything that needs to be added/edited to this poster before we publish and print? If so, please advise! A successful day toward eupan efforts! I met with Randy Swanson at the State Capitol! I learned much and have several new persons to meet and work with as an extension of that meeting! Additionally, I met with the Program Director at the Ronald J. Norick Library in Downtown OKC to confirm our public screening of Pray The Devil Back to Hell in the "46th Star Auditorium." We have our contracts in hand to screen Pray the Devil Back to Hell for Monday, November 30th at the Herrick Auditorium at Southern Nazarene University at 7:30 p.m.(Located on Old Route 66 at 6729 NW 39th Expressway, Bethany OK 73008 ). The downtown library screening will take place Sunday afternoon, 2:00 p.m. on March 28th, 2010. We will be providing public information in the way of flyers and posters for each event soon! Here is a picture of Randy and I in the entry-area for the State Senators at the State Capitol. Senator Glenn Coffee - toward eupan! In anticipation of work to take place on our genocide efforts - including forthcoming travel to the U.N. - I have scheduled a meeting with Randy Swanson at the State Capitol for this week. The meeting agenda I have requested includes how Oklahoma Senators are apprised of issues relating to global violence in the form of Genocide. Randy Swanson is part of the Senate leadership staff as Majority Leadership Communications Director. Swanson directs media, press and public outreach activities for Coffee and the Senate’s Republican leadership team. For the first time in the state’s history, Republicans have the majority in the Oklahoma State Senate. "Glenn Coffee is a businessman and attorney who is the first Republican in Oklahoma history to serve as President Pro Tempore, the top leadership position in the Oklahoma State Senate. Coffee is also the longest-serving Republican leader in the Senate. In 2008 Republicans made history by winning their first-ever majority in the Oklahoma Legislature’s upper chamber. As the leader of the new majority, Coffee was elected to a two-year term as President Pro Tempore (2009-2010)." I have been asked recently how eupan is different from any other "peace" movement. I offer the following as a reflection. First, in some fundamental ways we are not trying to do something "new" for the world. Second, we recognize there are good "groups" out there doing many good things towards "peace" and reconciliation and justice. Third, we are not trying to "do more" or "do better" than any other group that exists and we applaud all groups working toward peace/reconciliation. Fourth, we certainly do want peace in the world, so, we bear resemblance with any "peace" movement. Fifth, more than "justice" or "peace" - we want to see something that is more akin with uniting justice and peace. (Nicholas Wolterstorff authored Until Justice and Peace Embrace which has similar themes.) Peace can be viewed as "merely" the absence of war or violence. And we certainly hope for this, want this, and will work for this! But, we want more than only passive peace - where peace is seen as the absence of violence and oppression. We want to see active peace where the good is extended - charity exemplified - grace demonstrated and mercy lived out. We want not only the absence of violence, but the extension of good - good food, good resources, good neighbors, good environment, good, good, good,good . . . good for all! So, eupan is about peace, but is also about *more* than just peace. It is about extending peace in totalizing ways. November 30th, 2009 - possibly March 2010! We have a confirmed screening of PRAY THE DEVIL BACK TO HELL for Monday Night, November 30th. 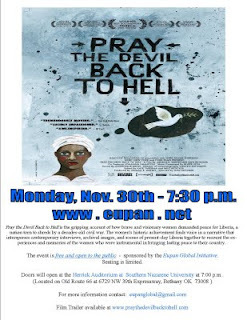 This viewing is hosted and paid for by the Eupan Global Initiative and is open to the public! The event will take place at the Herrick Auditorium, located on 39th Expressway (Route 66) in Bethany. Address is: 6729 NW 39th Expressway, Bethany, OK 73008. Time will be announced later - and we will be doing more advertising - so hopefully you will see more details in and around Oklahoma City. Also, we have a likely 2nd screening of the Movie in association with the Downtown Ronald J. Norick Library in Oklahoma City - which will take place in conjunction with Women in History Month (March 2010) - anticipating Genocide Prevention Month (April 2010). And that will be *very* appropriate since the women in the history of Liberia, it seems, brought an end to violence that could have become a genocide! If you have interest in joining our efforts towards advancing "the good for all" - we will be able to use help in the next few weeks in "advertising" and informing person about our efforts. Please email mmichelson (at) snu (dot) edu if you have time and interest to work with us toward this specific effort! Good things are happening toward advancing our projects! We have had an initial meeting with the two persons within the Oklahoma City Metropolitan Library System of libraries - one meeting about our April 2010 Genocide effort and a second meeting coordinating toward the possible public screening of the film "Pray The Devil Back to Hell." The film is not *precisely* about Genocide, but it involves the unique role of women who forcefully but non-violently prevented mass slaughter and violence in the country of Liberia. More news and details to come later! Thinking about recycling and genocide . . .
One of the realities for the leadership team working with the Eupan Global Initiative has to do with attempting to discern what *specific* tasks or goals we want to achieve. There is so much that can be done towards making the world "good for all" that it is difficult to narrow-in on a few issues. But, here is a list of two *specific* things that the leadership of EGI wants to focus in on in. (1) Recycling and practices of recycling in our local community remain - well, "behind the times." And, more than just being "behind the times" - we are cognizant of the fact that recycling is a practice that people develop as a habit over time. Hence, the urgency of helping people make conscious decisions to recycle instead of "just throw it all away" becomes something that will be a long-term commitment. As a result, we will continue to work in the next few weeks and months - toward helping our local community focus on recycling efforts. But, we will keep this as a long-term sustained goal for our local efforts. We continue to press local city leaders to plan toward new practices for city-wide recycling efforts. We will continue to inform local citizens, as well, about how and why they should recycle. We believe daily practices of recycling can cause us to think about larger social and global issues of sustainability - including working towards precycling! (2) Sometimes "things happen" in life that bring a certain sense of external pressure to matters in life. For me, Marty, this has been true over the past several months with regard to issues of genocide - including the response (or lack of response) by church persons to think through issues involving genocide. After a series of insightful presentations and shared reading at a Seminar this summer at Calvin College, I returned to my work as a University Professor to discover I was scheduled to teach two separate sections of Professional and Graduate Study students on issues of Antisemitism and the Holocaust. Each time I teach this course, I use the final class sessions as a lens by which the Holocaust can be used to frame other events of Genocide in our world. As a result of these issues, and in consultation with the leadership of the Eupan Global Initiative, one of the issues we will begin to work for now, towards 2010, is helping our local community become more globally aware and socially involved in issues of Genocide. Our specific agenda items for this Fall will include working with any and all local libraries (University and our Metropolitan Library System) and local booksellers, to prepare for April 2010 as Genocide Prevention Month. Our advance planning toward this should allow plenty of time to collaborate with librarians and scholars around Oklahoma! This is our most immediate project. Resources that will aid us include material from the Genocide Prevention Month website - but we have some other ideas working as well. If you would like to join us - we welcome you to our next leadership meeting in early October. Please email mmmichelson (at) snu (dot) edu for more information! Today - September 21st - is PEACE Day! Here is a day worth noting! Welcome to Peace One Day! Person by person, piece by piece, we can make peace by peace. Sustainability On Film - in Oklahoma City! My wife and I - along with family and friends - have participated in many great events at the Oklahoma City Museum of Modern Art over the past several years. What a delight that they are presenting a September 2009 series on "Sustainability." As our economic, social and environmental activities become increasingly integrated on a global scale, the human species faces unprecedented challenges. In the wake of the groundbreaking documentary An Inconvenient Truth, filmmakers have been examining the complex issues facing our species and planet: climate change, dwindling natural resources, population growth, economic crises, and political conflict. Along the way humans are finding innovative, simple solutions from growing their own food, to green building, to developing new forms of renewable energy. These films explore how we meet our needs in the present without compromising the ability of future generations to meet theirs. Join us Sunday after the final screening for a panel discussion with local experts on how Oklahomans are dealing with the global issue of sustainability. Go to the website for the OKMOA for more information! The idea of releasing persons or nations from unbearable debt is an important concept. To this end, please be aware of a local conference (for Oklahomans) that will educate - and perhaps inspire - toward greater understanding. You are invited to join Jubilee USA Network for a day of inspiring speakers, educational workshops, and advocacy training sessions on international debt relief as a tool to fight global poverty. The conference will feature a leading African civil society advocate along with national and local experts and advocates on global hunger and poverty issues. The conference will explore the potential of debt relief to fight poverty in poor countries, and the biblical Jubilee call for debt cancellation and right relationships among peoples and nations. The conference will also include skill-building workshops on effective advocacy and building a global justice ministry in your church or community. Join us to broaden your understanding of our place in the world’s global village! What goes through your mind when you reach for the water faucet at home? If I am getting a drink, I'm usually thinking about how good it is going to taste. If I am cleaning something in the house, I always know that the most versatile cleaning agent is within a few feet of me. If I'm starting a load of laundry, I'm usually thinking about how I don not enjoy doing my laundry. But really, do thoughts of war, price-gouging, or making a day-long trip in the elements ever enter into your thinking? What "good" can be found when people are waging war over one of the most plentiful resources found on Earth? What "good" can be shown by those of us who do not have trouble receiving access to clean water? For myself, it means shorter showers, leaving the faucet off when it is absolutely not needed, not watering the lawn except when Mother Nature decides it is time, and many other ways. It is humbling to know that I am blessed with easy access to seemingly unlimited, (mostly) clean water... the same water that is fought over with war in other parts of the world. One of the texts that I am currently reading has to do with the war in Iraq and the ways in which troops are commanded there. One study that I recall examines two groups of soldiers in particular and they way that they position themselves in their respective Iraqi neighborhood. The first group of soldiers knocked down every door in the neighborhood, looking for those who instigate violence. They patrolled the streets at all times, even setting a curfew for residents at night. The second group of soldiers worked on providing basic needs for citizens, like dependable shelter, working systems of education, a dependable electrical grid and clean water for all. Could you guess which group of soldiers saw decreasing levels of violence in the neighborhood? Stories like these are not uncommon. Do we really think that we are so different from those who live in Iraq? Don't we all want "good" to be embodied in our neighborhood? The phrase "Reduce - Reuse - Recycle" have been around for quite a few years as a sort of "mantra" for thinking about how we use goods and resources and how we need to be wise stewards of the resources provided to us. The leadership team within the Eupan Global Initiative is considering various avenues through which we can effect both local and global change. In the suburbs of Oklahoma City is an old "Route 66" town known as Bethany. Bethany offers trash service two days per week - but has no recycling efforts. In fact, in our experience, trying to recycle is actually a difficult task because recycling services are very limited in the entire city of Oklahoma City. The Eupan leadership team is making plans to start with our local community to effect and change the way *this* local community trashes the environment. It seems likely to us that the local city governance could change one of the two trash days into a recycling day. In this way, the city would not need to incur additional costs for employees to run the program (since they could use "trash" personnel) - and, it may even create a modest source of income in revenue from recycled good. And, it would reduce our "violence" to the environment while making residents better stewards of our local and global habitat. If you have perspectives or insights on ideas for us - or if you would like to join us as we politick - we invite your comments here or your participation as we post updates. In a few short weeks I will have opportunity to dialogue with, learn from, and engage Dr. Waller and others. I am hopeful for the things I can learn to discern better violence - in order to effect more positively our world's need of eupan. If we had 26 days of world peace in 4 decades, we are more than 99.8% away from seeing world peace transform our world. While sad news, it can also be seen as hopeful for us. If we do even a very little, we have the potential to change much! Towards World Peace. Towards Eupan. We planted a garden several weeks back. I do not even remember when we planted for sure. We spent time today working it. Perhaps 6 total "man" hours were involved today. It is also like this with the Kingdom. Then the full kernel in the head. As soon as the grain is ripe. One of the things I value about this parable, and the lessons I am learning in the the garden, has to do with how unimportant I am in "creating" it and "making" "it" happen. Our six hours of work pale in comparison the the hours of "work" that happen with each ray of the sun and each droplet of rain - that I can neither create nor prevent. It grows of its own. I scatter, but I can not make it grow. My hope, my prayer, my desire is that we will find ways to make eupan happen. I will scatter the possibilities of it, and learn to trust with patience and enduring calm that night and day, as I sleep and rise, somehow apart from my knowing, goodness will sprout and produce a harvest of goodness. We kill . . .
By our anthropocentric bias, it seems evident that many world crises are anthropogenic, perhaps leading to our anthropocide - and certainly the extinction of some species within the biosphere. We can change our ways. I pray . . . I strive to be a person who effects, embodies, and lives toward eupan. I may, in fact, be a horrible model or example of it - and I am certainly no exemplar. Today I am reminded of the reality that individual persons continue to perpetuate and extend violence in our world. In the name of justice, sometimes violence is effected. I pray for many people; parishioners, kids, family members, criminals, students, administrators, politicians, sinners, saints, doctors, teachers, wives, husbands, addicts, lawyers - and the list could go on. I strive to be a person who effects, embodies and lives toward eupan . . . but sometimes prayer is easier. Praying for people is easy. Actually living out goodness, especially towards those who perpetuate and extend it, is much more difficult. I pray that God will help me to effect eupan. Prayer is easier than embodiment. Embodying goodness takes more work than prayer. But, I will continue to pursue prayer - and embodied goodness by embodying forgiveness. Today I am reminded that as hard as it is, both prayer and embodied forgiveness are better and easier than the pursuit of institutional disputations that perpetuate violence. I pray, especially, for the persons who are responsible for perpetuating violence. God be with you, God redeem you, and may God save us. Our consumption of "Fuels from Hell"
"To put it another way, the Industrial Revolution gave a whole new prominence to what Rochelle Lefkowitz, President of Pro-Media Communications and an energy buff, calls 'fuels from hell' -- coal, oil, and natural gas. All these fuels from hell come from underground, are exhaustible, and emit CO2 and other pollutants when they are burned for transportation, heating and industrial use. These fuels are in contrast to what Lefkowitz calls 'fuels from heaven' -- wind, hydroelectric, tidal, biomass, and solar power. These all come from above ground, are endlessly renewable, and produce no harmful emissions." This reminded of a June 26, 2008 post from a brilliant friend, James K.A. Smith on his blog, which I will cite below (with permission). If we are committed to eupan, we must consider ways in which we consume goods and resources for our good, that “take away” from the good of others. We consume goods and resources that take away from the good of the creation. Watching coal-miners at work, you realise momentarily what different universes different people inhabit. Down there where coal is dug it is a sort of world apart which one can quite easily go through life without ever hearing about. Probably a majority of people would even prefer not to hear about it. Yet it is the absolutely necessary counterpart of our world above. Practically everything we do, from eating an ice to crossing the Atlantic, and from baking a loaf to writing a novel, involves the use of coal, directly or indirectly. For all the arts of peace coal is needed; if war breaks out it is needed all the more. In time of revolution the miner must go on working or the revolution must stop, for revolution as much as reaction needs coal. Whatever may be happening on the surface, the hacking and shovelling have got to continue without a pause, or at any rate without pausing for more than a few weeks at most. In order that Hitler may march the goose-step, that the Pope may denounce Bolshevism, that the cricket crowds may assemble at Lord’s, that the Nancy poets may scratch one another’s backs, coal has got to be forthcoming. But on the whole we are not aware of it; we all know that we ‘must have coal,’ but we seldom or never remember what coal-getting involves. Here am I, sitting writing in front of my comfortable coal fire. It is April but I still need a fire. Once a fortnight the coal cart drives up to the door and men in leather jerkins carry the coal indoors in stout sacks smelling of tar and shoot it clanking into the coal-hole under the stairs. It is only very rarely, when I make a definite mental effort, that I connect this coal with that far-off labour in the mines. [...] You could quite easily drive a car right across the north of England and never once remember that hundreds of feet below the road you are on the miners are hacking at the coal. Yet in a sense it is the miners who are diving your car forward (pp. 29-30). In a way it is even humiliating to watch coal-miners working. It raises in you a momentary doubt about your own status as an ‘intellectual’ and a superior person generally. For it is brought home to you, at least while you are watching, that it is only because miners sweat their guts out that superior persons can remain superior. You and I and the editor of the Times Literary Sup., and the Nancy poets and the Archbishop of Canterbury and Comerade X, author of Marxism for Infants–all of us really owe the comparative decency of our lives to poor drudges underground, blackened to the eyes, with their throats full of coal dust, driving their shovels forward with arms and belly muscles of steel (pp. 30-31). Eupan starts in local communities - in Bethany Oklahoma @ Southern Nazarene University, too! At Southern Nazarene University, we are pleased to announce the formation of Student Government's Task Force for Campus Stewardship and Sustainability! This group will dedicate themselves to having their voices heard regarding practices of sustainability that affect students today, and students of the future! If you have an interest in being on this Task Force? Membership is OPEN to ALL!, the first meeting is Wednesday, April 15th at 2:00pm, at SNU, in the Student Life Conference Room located in the Webster Commons. Oklahoma City Opportunity towards eupan! The Oklahoma Society for Science and Faith (OSSF) is pleased to announce the Ecological and Environmental Ethics conference to be held on the Southern Nazarene University campus on April 23 - 25, 2009. Keynote speakers include Dr. Larry Rasmussen, Dr. J. Matthew Sleeth and Dr. Laura Ruth Yordy. I have the privilege of serving on the Board of the OSSF and have read written works by each of the authors and am certain the conversation and reflection will be worthy of your time. I have returned from a week of teaching in Costa Rica - in the Cloud forest located in San Gerardo de Dota, a small community in the Talamanca mountains in the midst of a precious ecosystem. One of many observations I came home with has to do with simple practices of "reduce, reuse, recycle." While I was with undergraduate and graduate students, professors and parents who work in the midst of the laboratory environment in Costa Rica, I noted that they reuse and recycle - well, everything! From writing on pages across the entire line (ignoring those faded pink lines that leave white space) - to printing on the back side of every piece of paper - to composting all food and sorting through all tin, aluminum, cardboard, paper, and more - I came home with a model that I can pick up on whereby I might learn to practice better the issues of care and concern for my own, personal use, towards eupan. Passing along information here as I continue to learn. The Natural Step is an international not-for-profit organisation [sic] dedicated to education, advisory work and research in sustainable development. Since 1989, we have worked with thousands of corporations, municipalities, academic institutions and not-for-profit organisations [sic] that have proven that moving strategically toward sustainability leads to new opportunities, reduced costs, and dramatically reduced ecological and social impacts. The Natural Step Framework is a proven, scientifically robust model that helps organisations [sic] make pragmatic decisions to move toward sustainability. We research the science of sustainability and link it to real world applications. We create dialogue about the opportunities and challenges in building a sustainable future. We are accelerating change toward sustainability. The Eupan Global Initiative will host Dr. Dennis Siegfried for a public presentation on Monday Night, April 6th. At 6:00 p.m., Dr. Siegfried will be presenting in the S.T. Ludwig Religion Building around the theme: "Environment and a Christian Perspective." Professor Dennis Siegfried is a faculty member in the biology department at Southern Nazarene University (SNU). He is extremely involved in the operations of Quetzal Education Research Center (QERC) and in its education and research missions. Dr. Siegfried holds the Ph.D. from the University of Oklahoma and is a member of several scientific communities, including the Academy of Evangelical Scientists and Ethicists, the American Ornithologists’ Union, and the Ecological Society of America. The presentation will last approximately 60 minutes and will be followed by a time for public Questions and Answers. I am not thrilled about violence. But I am thrilled to take note of an exciting opportunity for me, personally, and for future options for the Eupan Global Initiative. I have been selected to be among other scholars in considering issues of violence and the church. The Seminar I am now making plans to attend (based on the announcement of my selection today!) is part of the Calvin College series of Seminars in Christian Scholarship. “Deliver Us From Evil: Genocide and the Christian World” will explore the role of the church as a social institution, with institutional actors, and how it shapes a culture in which genocidal violence may occur and how it responds to such a culture both during and after the genocidal violence. Over a three week period, participants will critically examine the role of the Christian churches in 20th century genocide and the subsequent consequences for Christian thought and practice in the contemporary world. Embedded throughout these analyses are questions of the moral responsibilities of the institutional church; the churches’ standing as manipulated or independent actors; how and why churches become linked with power holders in genocidal regimes; how institutional church leaders use rhetorical and theological devices to develop religious justifications for genocidal belief systems; the variability of institutional churches’ responses; the motivations behind churches’ interventionist role in reconciliation after the genocidal violence, etc. Such questions remain keenly relevant for church-state relations in contemporary international affairs – for instance, the ongoing genocide in Darfur; the escalating violence in Zimbabwe (about which church leaders are warning could reach genocidal levels); and the recent move in Russia to coronate the Russian Orthodox Church as the de facto official state religion, reinforcing a nationalistic ideology while promoting state-sponsored religious intolerance. Crucifying Jesus or indebtedness in quantities that are this excessive? In the context of the story of origins narrated in the Bible, it all starts with a garden. One way to frame the story of God, most briefly is that Creator creates creation. The idea of Creation and the quality of that creation - namely, "good" - is a core idea to the foundation of eupan and the Eupan Global Initiative. It does seem to be the case that the story of creation demonstrates in geography as well as in orientation, that people "move away" from God's garden. To the extent that we can, metaphorically, get closer to God's garden, we can reinvigorate God's goodness for the world. I genuinely believe that anything we can do to get us closer to God's (Eden) Garden intention, moves us in the direction of eupan. I find that I am always trying to discern patterns of violence in our world - bringing "goodness" to those patterns. For me, violence is a very "large" word. I think most people associate violence with some form of physical action enacted by one person (or group of persons) against another person (or group of persons.) By this understanding, violence is when I hit someone or violence is when a nation attacks another nation. It is easy to call physical violence "violence", because the scars or bruises or physical death it manifests are easy to "see" - picture, record, or describe in objective and quantifiable ways. It is harder to call silence "violence." In relationship even silence can cause "scars," "bruises," and "death." How can we become the kind of persons who demonstrate and effuse a kind of radical openness for the sake of others and ourselves? How can we model relationships that demonstrate only charity and kindness? We must discern such things. We must embody such things. We must enculturate such things. Perhaps, if we discovered a way to discern, embody and enculturate a kind of radical openness, in a stablized and structured world we could create a fertile habitat for all God's inhabitants in the world . . . it could seed a new kind of "gardened" existence for our world today. Every few months I get the opportunity to teach a class on Biblical and Theological perspectives for understanding human personhood. For me, this means we have to talk about relationships since human personhood is fundamentally relational. I get the opportunity to teach L. Gregory Jones' text entitled Embodying Forgiveness. Jones argues that violence does not have to be our master. He articulates a cruciform way of discerning the world, whereby we understand that God in the person of Jesus offers an example of how to make forgiveness happen. This forgiveness is not cheap or "therapeutic" but "costs" Jesus something, and costs us something too. Perhaps I will have more to say about it later. 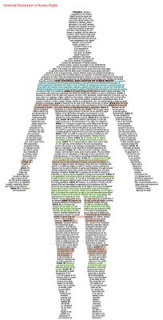 We need more models and better models of embodied forgivness. We need exemplars of how to overcome the patterns of violence in our world. 1 million, 1 billion - What difference does it make? I was reading God Gardened East by Louis Ruprecht the past few days. In the opening chapter he tells a story about an experience he had, meeting with a Philosopher while he was in Athens, Greece. The Greek Philosopher critiqued the American (Louis) for his failure to understand numbers. "The problem with you Americans," he noted with a sad smile, "is that you don't know how to count." Eyebrow arched, and a little defensive, Louis asked him what he meant. "You lack patience," he explained. "You don't take the time to think what numbers mean." The Greek Philosopher went on to note that, in his purview, most Americans do not understand the difference between a million and a billion. Louis would quip to the Greek Philosopher that he did know the difference - "Three more zeroes." The Greek Philosopher failed to laugh. One million seconds, the philosopher patiently explained, is roughly ten days long. Do you know how many days are in one billion seconds? As I read the text, I must admit, I was surprised. Indeed, I was shocked. Where one million seconds is roughly ten days, one billion seconds is roughly 32 years. It seems unbelievable. One million seems not too far removed from one billion . . . doesn't it? I mean, honestly, it doesn't seem that one million can be that far removed from one billion. Nor, does it seem possible that one trillion (if I have my math facts correct) is some 32,000 years of seconds! While I am *not* an economist who readily confesses my ignorance . . . I must also confess, I worry in deeply troubling ways for the future. If the facts regarding what I read are true, the U.S. government is considering another bail-out plan of roughly $800 billion (give or take a few billion, it's just a few zeroes after all.) That will be added to the more than $800 billion already promised with the ink barely dry on that legislation! This will make the U.S. Government bailout plans top more than 9.7 Trillion Dollars! This can not be good. This can not be good. I do not have an answer or answers. But, I know I need to learn how to count. And, I need to think seriously, very, very seriously about the grievous future I fear. I am not a nay-sayer. I want the best - the good for the all. 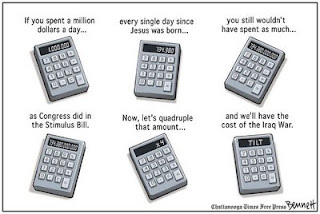 But 9.7 trillion is millions and millions and millions and millions of seconds away! It is so far away in seconds, that it is removed by, vast millenia! If we want the good for all, we must learn how to count better, to be more patient, and to be more frugal. I spun off on this one . . . The other night I was up late reviewing data/facts/statistics on issues of Global Climate Change for some work I'm doing on issues concerning Global Stewardship. I do not know how or where, but I "came across" links to SPIN farming. I spent too many hours perusing the ideas connected to SPIN farming and the persons in various parts of the country that are SPIN-ing. If I could slow down from too many "irons in the fire" in my life right now, I would love to SPIN here close to home. I have this grand vision of students from campus wanting to "dig in" to the efforts - perhaps on land right here around campus. But, then, I remember that they would probably rather eat in the cafeteria. So, what is a SPIN garden, you ask . . . well, SPIN stands for S-mall P-lot IN-tensive. * Its precise revenue targeting formulas and organic-based techniques make it possible to gross $50,000+ from a half- acre. * You don't need to own land. You can affordably rent or barter a small piece of land adequate in size for SPIN-Farming production. * It works in either the city, country or small town. * It fits into any lifestyle or life cycle. SPIN is being practiced by first generation farmers because it removes the two big barriers to entry - land and capital - as well as by established farmers who want to diversify or downsize, as well as by part-time hobby farmers. It's good for economic issues related to how money is spent within local places (ahh, thinking of great Wendell Berry poems/short stories here!). It is good for food produce - organic, healthy foods. It is good at getting "us" out into creation instead of into "big boxes." It is good for exercise and well-being. It seems eupan to me. Google harnesses the world's ideas for good. Google has used its access to a World Audience to generate ideas for making the world a better place. Non-Violence for all, from now until forever. Is it possible? The quote listed above is starkly tragic. Tragic in its truth. Our mimetic desire - our rivalry - or desire for more and more and more and that which the other possesses ultimately dispossesses us of our own lives and our own peace. Violence comes so naturally to us. But, it so naturally consumes us, as well. Early in the narrative of stories in the Bible, Cain acts in violence to dispossess Abel. When I teach from the text (in Genesis 4), I express to my students that at some level this is the “first story” of “life in the real world.” Whatever or wherever “Eden” “was” in Genesis 1-3, it is presented as a protected place. In the first story of life separated from Eden, Cain’s destruction of his brother – fratricide – demonstrates that the earliest persons in this tradition – the earliest humans in the “real world” of life – choose violence. The Biblical story and the history of persons spread across the globe narrate again and again and again how one person or one people group or one nation violently dispossess another person, people, or nation – and violence continually tears at the seams of human history. Could we give nonviolence a chance, for a century? What would it take to narrate it to persons in our world? Can we educate toward nonviolence? Can we enculturate toward nonviolence? Can we empower and enliven peace? Seeking to find that way towards eupan. The Death Penalty still brings death . . .
An execution vigil is planned to pray for the life of Darwin Demond Brown and his victims on January 22 at 5:30 pm in front of the Oklahoma Governor's Mansion (820 NE 23rd). The gathering is a peaceful protest to acknowledge that every life is valuable and that capital punishment is not a healthy alternative in our society. The New Yorker has just published an excellent piece on Gary Haugen and the International Justice Mission. More justice for more people brings eupan. In the December 2008 issue of National Geographic I viewed an intriguing presentation of the Universal Declaration of Human Rights - which just turned "60." Certainly something every person committed to eupan should review. Links to the National Geographic commissioned presentation, by Oliver Uberti, can be found in below. The image I am presenting is Oliver Uberti's orginal that has been edited by a person who highlighted portions for their own purposes. I am certain all images are copyright Oliver Uberti and/or National Geographic. It would be nice if the Declaration could find fulfillment in our world soon. Eupan is committed to working toward its fulfillment - for eupan. This blog is not a tree . . .
On my immediate "reading" list is the following title: Cradle to Cradle. The book looks and feels like a book - but it is not a traditional book, since, for example, you can freely read it in the rain! It reinvents the idea of books in a different way than the Kindle Wireless Reader or other e-platforms for book-reading. "This book is not a tree." "It is printed on a synthetic "paper" and bound into a book format developed by innovative book packager Charles Melcher of Melcher Media. Unlike the paper with which we are familiar, it does not use any wood pulp or cotton fiber but is made from plastic resins and inorganic fillers. This material is not only waterproof, extremely durable, and (in many localities) recyclable by conventional means; it is also a prototype for the book as a "technical nutrient," that is, as a product that can be broken down and circulated infinitely in industrial cycles— made and remade as "paper" or other products." "The tree, among the finest of nature's creations, plays a crucial and multifaceted role in our interdependent ecosystem. As such, it has been an important model and metaphor for our thinking, as you will discover. But also as such, it is not a fitting resource to use in producing so humble and transient a substance as paper. The use of an alternative material expresses our intention to evolve away from the use of wood fibers for paper as we seek more effective solutions. It represents one step toward a radically different approach to designing and producing the objects we use and enjoy, an emerging movement we see as the next industrial revolution. This revolution is founded on nature's surprisingly effective design principles, on human creativity and prosperity, and on respect, fair play, and goodwill. It has the power to transform both industry and environmentalism as we know them." More on the subject when I have had time to finish reading! It seems to be a solid example of changing the way we think about buying (in this case, books) while still being consumers, but in a way that does not take an extended toll on the environment. Are we system(at)ically imprisoned to violence? I had intended to spend a few moments today commenting on the forthcoming inauguration of our new U.S. President, Barack Obama. While I am excited for his leadership, I am leery of power brokers in politics, because the proverb of history seems true. "Power corrupts. Absolute power corrupts absolutely." Further, promises do not guarantee actions. And, even President Obama's best hopes and intentions will be framed within a political system of persons and power and nations that will undoubtedly frustrate any goals he may have. I had intended to offer some reflection on the "system" of incarceration generally, prisons, "correctional facilities." I had intended to take some time reviewing material I am generally aware of - have read in the past - but would explore further - from Jeremy Bentham's Panopticon to Michel Foucault's Discipline and Punish: The Birth of the Prison. It seems to me that inherent in the "systems" of imprisonment are patterns of violence - and certainly the corrupt systems of imprisonment evidence exceeding violence. But, I am distracted this morning. The headlines of today (January 14, 2009) report that after nearly a decade of violent attempts to kill him! - Osama Bin Laden is still alive and advocating violent action against Israel. And, some persons in Lebanon join from north of Israel bombing sites in Israel - it appears joining in the volley of efforts coming from south of Israel in the area of Gaza. Israel violently retaliates, unquestionably killing the "perpetrators" of the violence in their own violence, while also killing and injuring thousands of innocents. The violence of Al Qaeda and Osama Bin Laden - bring death. The violence of campaigns against terrorist organizations - brings death. The violence of Governments - brings death. The violence of incarceration (so called "just" and certainly unjust) - bring death. The violence of a volley of rockets - brings death. The violence of retaliation - brings death. When and how can we learn to unmask the myth(s) of violence and bring good to all? Is it possible that we are ourselves part of systems of violence that, perhaps - unknowingly - imprison us. Is this the only way? Can we not think in other ways? We must find better ways if not the most excellent way. Our death depends upon it. Thanks to L.V. for the great thoughts and contributions! My daily reading includes the blog of "Bikehiker" the Reverend John Hay, Jr. I've requested permission to share his words here. Gil Bailie has done work with the ideas of Rene Girard, which have been central in my formative thought in dissertation work. But, I can not match the clarity of poetic skill that John Hay, Jr. demonstrates. NEW SITUATION, OLD STORY. Last January, Kenya erupted in a convulsion of ethnic violence. This January, Israel attempts to quash--"once and for all"--rocket attacks launched by Hamas from Gaza. Never mind that hundreds of innocents have perished. And the wars and suicide bombings in Afghanistan and Iraq continue with no end in sight. Each snuffed-out life cries out in testimony. I share the following reflection out of my appreciation Gil Baillie's book Violence Unveiled and in my confidence that nonviolence is the certain path into a grace-full future. You are as important as me. They are as valuable as we. for the value of one. love to grace every last one. we slowly die by our own sword. that cry out each to God. nor make it possible for others. Starting small . . . . I was sharing with a new student the "vision" behind the Eupan Global Initiative. Admittedly, like most agencies, consortiums, or groups, we have started small. We may never grow into anything "big." I talked to the student about two (of several) websites I frequent often. Those websites are associated with Sojourners and the Israel-Palestine Center for Research and Information. Sojourners developed from student conversations in the early 1970s and IPCRI emerged with the late 1980s Intifada. Both are now "large" "agencies" that advocate in significant ways. Will the Eupan Global Initiative ever grow "as big" as Sojourners or IPCRI? Well, quite frankly, I have no idea. But, I don't really care. If we can effect "good" for even a few - and inspire "good" for all - we will have done something. My hope is that Eupan will inspire our dreams in the field of nonviolence. I've been asked to sit in on a special seminar this Spring semester, including readings on the Psychology of Peace. This is being coordinated by a fellow faculty member at SNU who is a Ph.D. in psychology. The professor has has been working with others in our local community (OKC area) to allow for conversation among various faith traditions - our local Interfaith Alliance. I look forward to learning more about this area of study! I wish I could apply the psychology of peace to the current outburst of violence in Israel/Gaza! Having spent many weeks in this area of the world, I long for and pray for their peace - may good be extended for all! As we move into 2009, I am happy to announce that the Eupan Global Initiative is making progress! We have a scheduled meeting of the current Board of Advisors today, January 2nd, 2009. LV has been working on creating a logo for Eupan - cool ideas already working with guns and their violence being transformed to olive branches of peace! Plans for the immediate New Year will include an Open Meeting for any persons in the Oklahoma City Area to participate with us in viewing and responding to the Laura Waters Hinson Film "as we forgive." Dates, Times, and Location to be announced though it is expected that the event will be hosted in coordination with the Southern Nazarene University School of Theology and Ministry, likely in the S.T. Ludwig Religion Building located on campus.